Tired of having to go open a number of browser windows to perform a search across a number of search engines? Sputtr wants to make it easier by putting search engine results to your favorite search engines in one page and just one click away from results. As it's name implies, you don't need to sputter to perform several searches from various sites. I know what you are thinking, it sounds like a trivial mashup but I thought Sputtr's simple approach and clean, aesthetically pleasing design were worth showcasing. 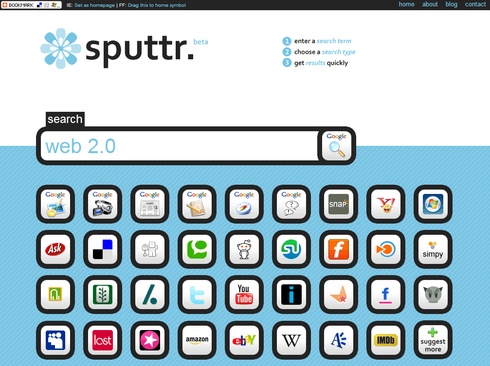 With Sputtr, you simply put in a search term then click an icon from the search options below the search box to be taken to results. Like I said, it is a clean and simple approach but so is Google and look where they are now.